Your roof may need a health check - Why maintaining your roof can save you money! On an ordinary Friday afternoon in January, a freak storm hit Canberra. Temperatures dropped nine degrees in nine minutes while winds strong enough to uproot trees and damage properties ravaged the city. In a storm, the only thing that is keeping you and your family safe from the force of nature is your house roof. A roof that’s not well-maintained can take a bad hit in a storm. That is why it’s best to keep up the maintenance of your roof all year round. The truth is, the cost to fix a damage to your roof is usually more expensive than the investment you pay to keep it in tip-top condition. Ideally, your roof should be checked by a professional every year for signs of damage. Consider also having a check after a potentially damaging event like a hail storm. At other times, a simple walk through of your house can help you identify problems. Dark spots, browning stains or bubbling/blistering paint on your ceiling and walls are sure signs of an existing leak in your roof. Also, look for damp areas near your fireplace or sunlight shining through your loft. Any tell-tale sign should be attended to immediately. A roofing maintenance professional can easily step in to fix and repair leaks and damage to your roof. The exterior also needs to be checked regularly. It is never a good idea to attempt to walk on your roof. If you are comfortable with heights, use a ladder to view the top of your roof and have someone standing by below to take notes. Alternatively, use a pair of binoculars from a good vantage point. If you cannot perform either, then it’s time to call in the professionals. 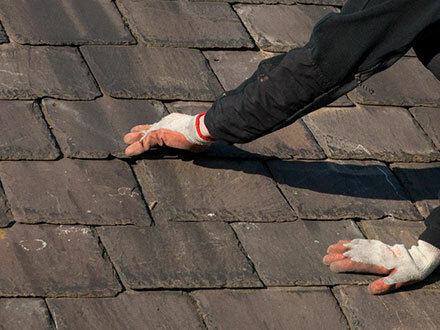 When checking the exterior of your roof, look for chipped or missing tiles. An uneven and spotty roof indicates age and will most likely need fixing or replacing. Also, check your chimney's flashing for signs of peeling and cracks. Skylights, vents, and structures installed on your roof should be looked at to ensure that the sealant used to hold it in place is still holding together. And don’t forget the gutters. A build up of dirt and leaves should be regularly removed as it can block the drainage channels of the tiles and damage your roof. Finally, moss. Moss loves water and it will damage your roof. If spotted early, it can be easily removed by a roof maintenance professional. But if the moss is old and established, it will require delicate chemical treatment. Keeping your roof in good condition gives you peace of mind in a storm. It also helps minimise the risk of damage to your roof and expensive repairs later. A clean, spruced-up roof can enhance the aesthetics of your home and add value to your house without you having to invest heavily in a new roof. Has your roof undergone a health check recently? If the answer is no, then it’s time to call National Capital Roofing on 0407 212 491 for roof maintenance in Canberra.